Excitement for green technologies and energy saving solutions was at its peak in Malaysia this month as the International Greentech & Eco Products Exhibition & Conference (IGEM) 2012 took place from October 10 to 13 at the Kuala Lumpur Convention Centre. 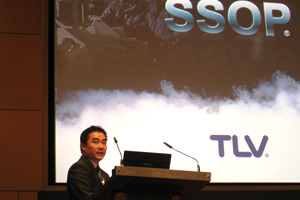 TLV held a short seminar about the Latest Technology in Solving Steam System Problems, which underlined the keys points about properly managing a steam trap population. The audience numbered roughly 150 people, and featured a mix of factory workers, tradespeople and students. Mr. Wary Low, Sales Manager at TLV Engineering SDN. BHD., was pleased with the presentation: “A few participants I met [...] were very knowledge about energy efficiency, but only in electrical”, said Mr. Low, adding that the seminar gave TLV the opportunity to communicate the need to save all types of energy. An important part of TLV’s mission is to increase awareness of best practices in steam and condensate systems in order to save energy safely and efficiently.